Tattoo Blog » Arm Friends. Tattoo Blog » Dislike » Arm Friends. 3D has made a big comeback in the last few years, there’s no doubt about that. And while most of the 3D that is on offer is slightly less than impressive in its execution, that doesn’t mean that it’s any less popular. As it meanders its way through everything from websites to films to television to video games, 3D unsurprisingly has found its way to tattoos. As a matter of fact, last year I actually wrote about a new sort of “virtual reality” concept of tattoo. You can read more on that here. I’m sure that it will be a while yet before 3D tattoos are the norm, but every new idea needs its test monkeys, its “pioneers”, so to speak, and who better to test out these sorts of things than video game nerds? These guys will do pretty much anything to live alongside the animated reality of the video games they spend their lonely days playing and fantasizing about. Which is why it didn’t surprise me one bit when I saw that a blogger by the name of CranberryZero has been tattooed with a Nintendo 3DS AR card. I won’t go into detail about exactly what the AR card does – mostly because I myself don’t really know – but judging by the photos and the ultra blurry/shaky video here, the AR card is a kind of blue screen that allows animation and 3D graphics to appear on it. 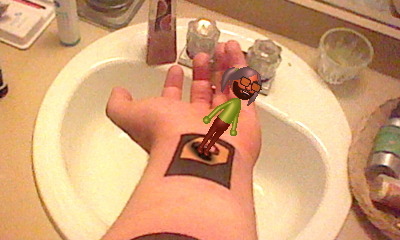 What that means is that once this CranberryZero guy got his tattoo, he could then turn on his Nintendo 3DS, which would then project an image on his 3DS screen of computer generated graphics walking around on his forearm. I guess if this sort of thing is exciting to you, then this is an amazing, awe inspiring idea. For the rest of us, it simply begs a lot of questions, for example, what the point of a novelty tattoo that requires carrying around a Nintendo 3DS is and isn’t that a lot of work just to have a couple bouncy boxes and little men appear on your arm? Oh well, I suspect this type of technology is only going to become more popular – and I hope of a higher quality in the coming years. Then again, it could end up being the equivalent of having a Commodore 64 tattoo from back in the day when you thought that the Commodore 64 was at the heights of technology. No? Anyone else remember the Commodore 64 out there?? Holla!! !